Got the winter blues? 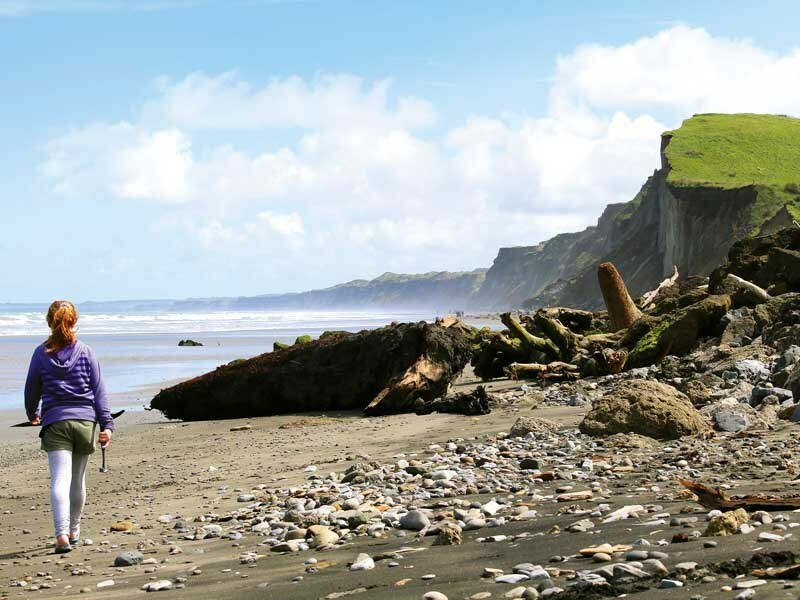 Why not follow the footsteps of NZMCD travel writer Nina Mercer and unearth some treasures near Whanganui. 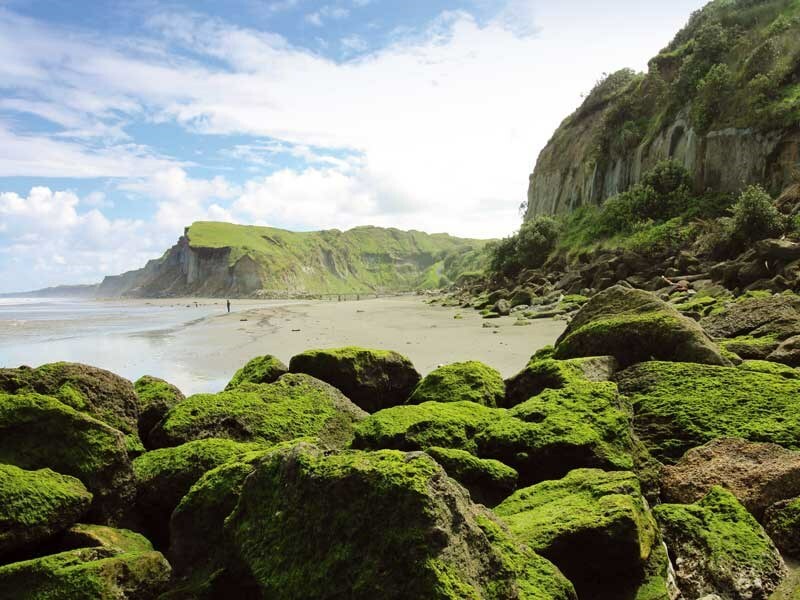 With a free winter weekend and a budding palaeontologist in the family, we researched fossil fossicking areas and came up with a winner—Kai Iwi beach just to the west of Whanganui. After turning off soon after Whanganui, we travelled towards the coast, by chance driving past the entrance to the Bason Botanic Gardens. Carrying on, we reached the small settlement of Kai Iwi, home to a collection of houses, holiday baches, and a holiday park. Down came the rain, but soon the skies cleared and, geological tools in hand, we ventured to the towering cliffs at the eastern end of the beach. The soft sedimentary mud cliffs were filled with semi-fossil shells and we happily spent our time trying to gently dislodge these treasures. The cliffs are somewhat unstable, so we kept a careful eye on them. As the sun began to shine, we ventured further down the beach meeting a solitary white-baiter and a few other walkers. It is a beautiful beach that stretches into the distance and we had it almost to ourselves. Intrigued by the botanic gardens, we retreated to the car and backtracked. 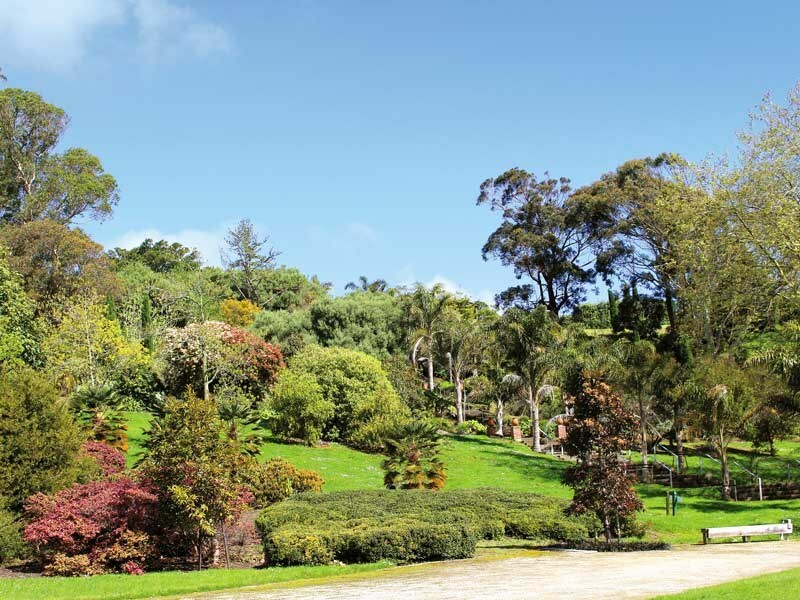 In 1966, Stanley and Blanche Bason gifted their farm, home and garden to the people of Whanganui, and what a gift it is! With a vast area covered in themed outdoor gardens, driving around the gardens was the best way to see everything. But the conservatories housing orchids and other sub-tropical plants were definitely the highlight on this cold day. And for those looking for a physical challenge, there is a three-hole disc golf course.